Sonya’s is a little family run restaurant hidden in plain sight at the corner of Henderson and Hart. The entry vestibule is a TARDIS and when you step out the other side you’re in a small town diner in the 1970s - in Czechoslovakia. Steve is a hoot and his humour shows up in the notices posted around the restaurant. The pitcher of water is “Vodka”, knives are "only for boorger, not for fight!" and the soup of the day is always "Good homemade." Steve took orders by table and handed them off to Vera cooking in the kitchen. The food came out in waves and the burger patties were steaming hot off the grill. There were thirteen burger-clubbers and everyone loved their burger! Everything is home made - even the mayonnaise. Sonya’s burger came in at #2 just behind Charlee’s, received the highest restaurant experience rating, and raised the bar for great value. The owner Steve’s personality makes the whole experience - Sonya’s really is a treasure. 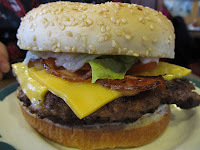 The burgers are a good size and the prices are like the décor … wonderfully from the seventies. A Fat Boy is served to you for only $2.60! Sonya’s is at the start of the Disraeli Bridge construction so parking is a bit tricky right now. There are a handful of stalls behind the restaurant if you’re lucky enough to get one. Everyone had a bacon burger. Well, except April who later said “should have ordered some too. Never hesitate on the bacon!” You have the option of a spicy burger. Get it spicy - it comes with tangy Jalapenos and a Dijon mustard sauce that really adds to the experience without being overpoweringly hot. Also, I think this is one of those "less is more" situations and a single burger offers better flavour balance. The patties are big and I didn’t need the double to satisfy my hunger. 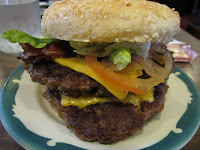 The burger patties were hand-made and had a helluvalot of flavour. They were crispy outside and juicy-moist inside. Nelson said “the whole thing melted in my mouth.” Every cheeseburger came with two slices of cheese! I have a strange affliction - I like the taste of processed cheese and enjoyed the stand out flavour. If you’re not a fan of processed cheese you might be a little sad though. The bacon was perfectly crisp, but a little scarce. Spring for the extra 50 cents and get a second slice for more flavour. Scott commented “Om-nom-nomy! I loved the fresh onions, although my co-workers may have a different opinion.” The bun needed warming but did its duty - with sesame seeds on top! Brett described the fries as “limp, not crispy - like rectangular mashed potatoes with gravy.” Cary ate all the table fries at Table #2 so I guess he was a fan. Cary also ate Kari’s burger (as well as his own) so hopefully that makes up for getting stiffed at the great Black Sheep debacle last week. There’s a splendid tool calendar by the cash register upholding that age old tradition of beautiful buxom bikini bound babes beholding bandsaws. Steve pointed out that Ms. October is his cousin and Ms. November is his sister. I like Steve. and boy is that beef hot! Here is no bus shelter, classic Jorge! Be careful of those Uzbeks drinking the fluid out of your battery while you're parked nearby. What about Luda's? They have the best Deli Burger. You read my mind. Next week we're dining at Luda's! Again, my wife and I were looking for a good burger today (Saturday). We turned to the Burger Club Blog for assistance. Last time we went to Charlees. Today, we decided to try Sonya's. So with our 3yr old son we were off. 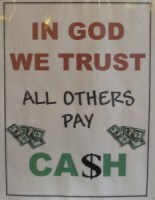 Unfortunately, I missed the part that this restaurant is cash only. I had to trek down to the Cash Store at the corner to get some. There were only 4 other tables occupied but service was slow. The owner was the only one to be seen. Not sure if he was serving, doing cash AND cooking but it took a while to get a menu. He was nice and pleasant though. Big personality. My wife and I ordered 2 bacon cheeseburgers with fries and our son had a grilled cheese sandwich. By the time we entered the building and got our food over an hour had passed. My wife even had to go to the front to get our drinks as they were forgotten. The waiter never came back to ask how things were or if we needed anything else. My Mother always said you can tell the quality of an establishment and what the kitchen might be like by the bathrooms (cleanliness). They are located in the basement (don't hit your head on the way). I do wish there were more fries but for the price you could order more and not blink. We did leave satisfied though. Just heard piece on CBC radio this morning and glad I had it on that frequency! I'll be headn out on holidays next week n sure to try n check out couple places on list. They have great place called POYEYE'S located just past bridge outside of Thompson in case anybody thinking about road trip north! I heard this on CBC this morning also. 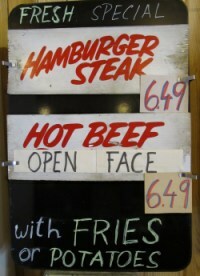 Really like your blog, but find your burger ratings are too much the same. If rated between 1 to 10, it might make more of a difference. Current ratings mean I can go almost to any of them and have a great burger. Ratings between best and next and next are too close, by just a point, not a whole number, if u know what I mean. Gave it a try about a week ago. Burger and fries were best I have ever had in Winnipeg, and I am a senior. Burger had the nice crunchy outside and nice juicy thickness, not too thick, not too thin. If anything, it would have been good to put the bun down on the flattop so it would get warm and crunchy. Fries, home cut, crispy and not too greasy. And price is fabulous. Likely less costly than McDonalds. 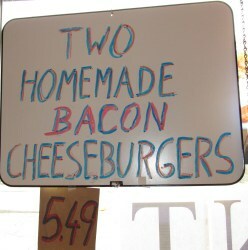 $5.50 for bacon cheesburger with fries or soup. Where can I sign up to join the Burger Club? Unfortunately Carson, by the time you posted that Burger Club was planning its wrapup. This happened 4 days after your post. We're not sure what we're pursuing next yet. I used to go to ths place circa 1964. It was the owned by a one armed guy named Pete and was called (naturally) "Pete's Place"
The man made the most incredible fries. They were half inch square slightly limp and almost like mashed potatoes on the iside and incredibly tasty! Although I never did try the burgers the fries were so good that when I was a kid of 13 I would take the bus to Elmwood from north Kildonan to go to the dentist. I would insist on not having a needle for pain just so I could get some fries later on. Just joined the Burger Club today and looking forward to my first meat and grease! Wimpymmm: That’s a great story – thanks for posting it. Pete's Place was recommended by a few readers, but we never made it. 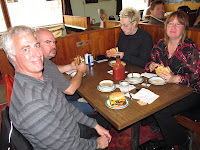 There're so many great burgers to choose from in Winnipeg! 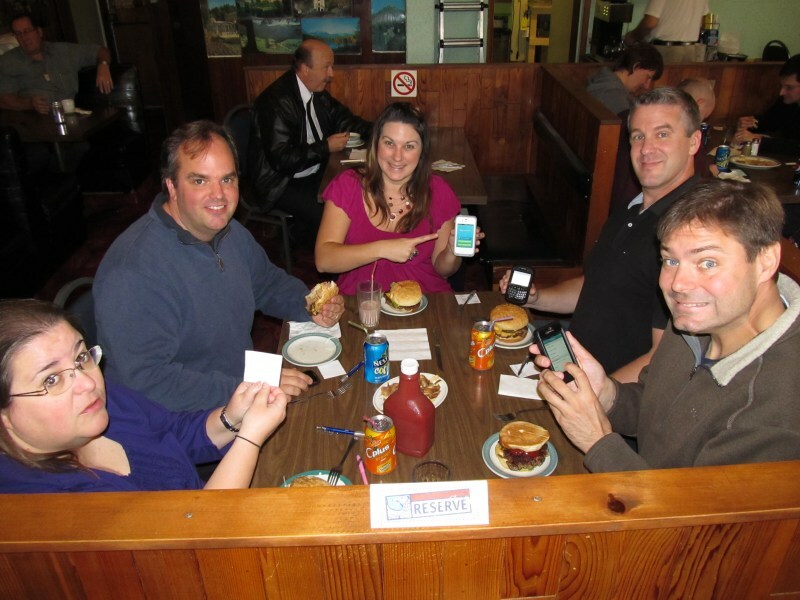 We just had our Burger Club wrap-up and don't have any more burger excursions planned. I think you are referring to Pete's Place on Main st. The Pete I'm talking about would be almost 95 if he were alive. Are you the creator of this Blog/Burger Club and is this wrap up a seasonal thing or permanent? wow sonya's voted # 1 thats a joke. Burger mob (blog) shouldnt rate high just cause the owner is friendly. 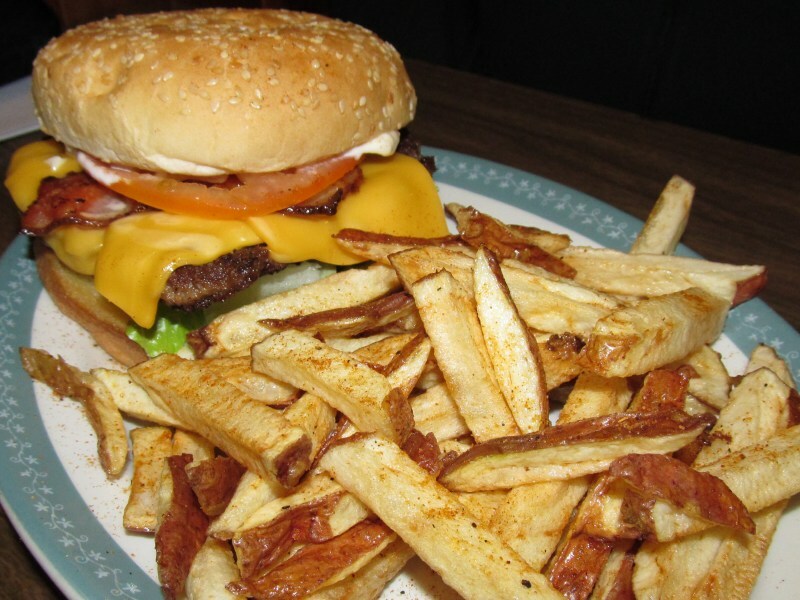 Sonya's is a place where the price is right for what you get, cheap fries, poor gravy, but a better then average burger ! Just came a cross this club on Urban Spoon .I have a restaurant that is shown on their , Eat Fork Spoon Pizza & more. When we first opened most people that tried our burgers for the first time would come back and say wow that was the best burger I have ever had ,and quit often order an other one after saying that .Now we have about 7 different burgers on the menu their all monsters just packed with flavor . After reading the rules I am a little disappointed that only all beef burgers qualify for judging.One of our most popular burgers is the Jalapeno burger with our house made Jalapeno sauce made to order ,made with all fresh ingredients . How ever all our other burgers are no slouches in any way . 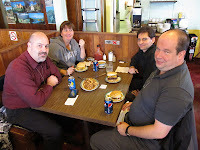 But the one thing about our place is we sell so much more then burgers ,So if any one stops in too try the best burgers in WPG Ask the other people their what is good to eat and the most comment answer will be (theirs nothing that comes out of that kitchen that isn't delicious).